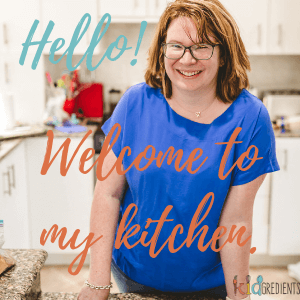 You are here: Home / Recipes / Lunchbox / Salmon and veggie balls, kid friendly and lunchbox perfect! These salmon and veggie balls are sponsored by Tassal Salmon, but all the opinions in here are my own. All kids love food shaped liked balls. Think about it, bliss balls, meatballs, they have kid appeal and these salmon and veggie balls are no different. Combining some of our favourite flavours, they have major kid approval! And, they go on skewers in the lunchbox, and we all know that food on a stick is a major winner for kids! When it comes to ticking nutritional boxes, Tassal Salmon is our protein of choice! It has all the good stuff you need, and we aren’t just atlking about the fact that it is high in omega 3! It also contains a whole host of other goodness in the form of 42% of your daily protein requirements (from just 100 grams), vitamin D, vitamin B6, vitamin B12, phosphorous, magnesium, potassium and selenium. We have been making a whole series of salmon recipes, these crunchy panko salmon bites, salmon sandwich sushi and this amazing honey soy salmon and veggie stirfry that is perfect for midweek meals. 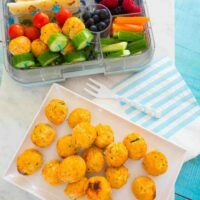 These salmon and veggie balls are perfect for the lunchbox, for popping on top of your favourite pasta and sauce or for babyled weaning. I’m always trying to think of easy ways to make the lunchbox better for kids and these are perfect for it as they are packed with protein. They also freeze well, defrost overnight in the fridge before popping in the lunchbox- with or without the skewers! Perfect as a lunchbox filler that helps you to move away from the sandwich. Gluten free, egg free and dairy free, they are perfect protein boost for kids! Because they are baked, not fried, these salmon balls are healthier than your average fishcake but still retain all the yum factor. We’ve used fresh salmon rather than canned as it is moister and allows the balls to retain that moisture when cooked. These salmon and veggie balls are gluten free, dairy free, egg free and packed full of yum! Kid approved and perfect for the lunchbox or even baby led weaning. Peel the sweet potato and chop into large chunks. Steam until soft and mashable. Cool. Combine the salmon and sweet potato and dill in the bowl of a food processor. Add the salmon mixture to a large bowl and add the carrot and zucchini. With wet hands, form the mixture into 24 balls. Place onto an oven tray and spray with olive oil (or place in mini muffin trays). Do i bake it then freeze? And do i need to rebake to reheat it? Hi Leona, thanks for your question. Yes I bake and then freeze. To serve I just pop them in the lunchbox. Could I use canned salmon if fresh is not available? You can, but as it isn’t as moist you might need to add some extra liquid. I hope that helps! Hi, did you cook the salmon before you combine the sweet potato? Nope! I popped it in the food processor from fresh. Yes they most definitely can! These sound wonderful. Do you know if you can substitute other fish as well? Have you tried any others or would this only work with salmon? I’ve only tried them with salmon= but you could try other fish!